It was late at night. The kids were asleep, and the wife was busy on the computer. I was all alone watching TV. Instantly, the deepest of my carnal desires rose to the surface. "She'll be busy for quite some time," I tell myself, flipping the channels on the remote...getting closer to my release. I reach the channel...turn the volume down for privacy, and sink into the most decadent form of entertainment known to man---Food Network. So what? I watch Food Network all the time. I'm a portly fellow, and watching drizzling peanut sauce next to a piece of swordfish excites me beyond belief. Some men waste time on skinemax, or countless minutes in front of the computer. My heart lies elsewhere. Yeah---my ultimate dream is to be a food critic. 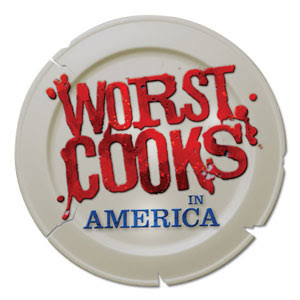 As I settled in for an enjoyable time, hoping to see fried chicken or Reuben sandwiches, I was disappointed as the channel was currently showing "Worst cooks in America." I almost quickly turned it to skinemax, but the show intrigued me. They had a bunch of the worst cooks I've ever witnessed. To be completely honest, they were horrible. I didn't realize some people had no idea how to cook fish sticks. Let me give a brief background on the show. Terrible cooks were nominated by family/friends to join the show, which were to be mentored through the process by 2 proffesional chefs. Chef Anne and Chef Beau. Chef Anne looks like Zsa Zsa Gabor touching a live electrical source, and Beau spells him name like a douche. Over 10 days, there were 2 teams led by each chef, and the terrible cooks were to complete cooking challenges. Each episode, a person from each team was kicked off by the chefs. By the end of the show, only 2 losers remained to cook a 3-course meal for professional food critics. I'm sure this sounds just like any stupid reality show. In fact...it is. Tears when kicked off. Annoying speaking montages throughout the show. Cut to commercials right before anything interesting happens. But---it's actually quite interesting to see the progress these losers make. Oh yeah...did I mention Rachel? Scoring a quality 10 on the unintentional creepy scale is Rachel. She is one of the creepy/most annoying/scary people I've ever seen in my life. Every time I saw her, I flashed back to something in my past that I can't quite put my finger on---but damn is she scary. Check her out below. She's a perfect mix of Molly Shannon playing "Superstar", Thelma from Scooby Doo, and one of those scary sisters on "The Shining." She's like a car crash...you can't help but look. 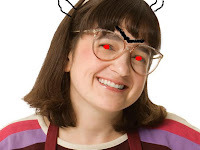 She may be the anti-Christ. I'm going to drop a spoiler here, but I figure that nobody really watched this show, so who cares. Creepy Rachel and goth-Jenny competed in the finale for the $25,000 prize. I don't want to spell out exactly who won, but let's just say that the anti-Christ grows more powerful every day. This show was a guilty pleasure, and I'm ashamed of giving it a delicious 3-star rating.